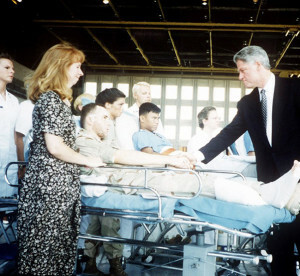 President Bill Clinton shakes 1st Lt Michael Harner’s hand during a visit with the survivors of the Khobar Towers attack at Eglin Air Force Base, July 4, 1996. President Clinton asked those at the memorial service including Secretary of the Air Force Shelia Widnall and Air Force Chief of Staff Gen. Ron Fogleman to praise the American heroes, who gave their lives in service to America. June 25, 1996 at 10:15 p.m., a large truck pulls into a parking lot across the fence line from the military housing complex known as Khobar Towers in near Dhahran, Saudi Arabia. Col. Michael Harner, then a first lieutenant, had just returned to his quarters from a run. Standing on the balcony, he looks out and sees the truck. Returning to his room, he shuts the sliding glass door and draws the curtains. He sits with the room’s phone in his hands, debating on whether to call security police and report the truck. Seconds later, bright light floods the room and the building shakes violently. Harner had only been on active duty for two years and this was his first deployment, but it changed his life forever. After the explosion, Harner called out for help but could not hear a sound. Covered in blood, he made his way around his room, attempting to turn on light switches to no avail. 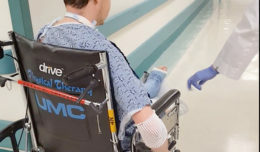 After collapsing in the stairwell of his building, he was discovered by explosives ordnance disposal Airmen and carried out of the building on a door being used as a makeshift skid. Harner’s recovery was highlighted by meeting President Bill Clinton at Eglin Air Force Base, Fla., days after returning to his home station of Whiteman Air Force Base, Mo. Even before the Air Force started using the Comprehensive Airman Fitness program, Harner had all four pillars aligned with himself. 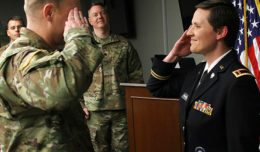 “I was the only Airman from Whiteman that was medevaced back to the states,” Harner said. “The support network coming back to the states helped provide faster recovery. My recovery stems from my faith as a Christian. My family supported me, too. I struggled with crowds and loud noises. I returned stateside two days before the 4th of July and I had no desire to be anywhere close to fireworks. 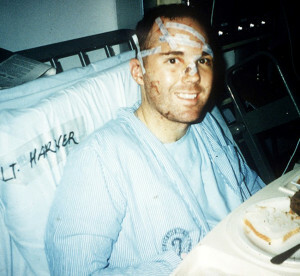 Then 1st Lt. Michael Harner sits in a hospital bed in Dharhan, Saudi Arabia. Just two days later, Harner was medevacked back to the United States. Harner said at that time, the military didn’t quite understand the effects of Post-Traumatic Stress Disorder. Harner recently spoke with personnel at Kirtland Air Force Base, N.M., about his experience. During the presentation, he showed photos of Khobar Towers after the explosion and of his recovery. Harner leaves a piece of advice to all Airmen going through tough times.